The tagline for the brand new Alma Courtyard hoi An is “Discover yourself.” more than just a marketing slogan, the spirit of discovery touches every aspect of this stunning property, boutique sister to 5-star Fusion maia Da Nang and À La Carte Da Nang Beach. The 145 rooms surround the swoon-worthy courtyard comprised of a picturesque pebble pool and two beautiful swimming pools, one with a soothing water feature. The second jewel of the resort is Alma Courtyard’s massive spa complex, Vietnam’s largest, with 40 treatment rooms and 90 therapists able to accommodate 70 guests at a time. After a refreshing morning swim and a healthy breakfast, guests can go on one of three spa journeys (cleverly tied into Vietnamese folktales) which includes a steam or sauna, a 50-minute massage, tai chi or still relaxation in the studio and meditation or a relaxing hot soak in the cavernous Silent Sanctuary. Best of all, this 90-minute spa journey is included in the room rate for each day of stay. A la carte treatments are also available. For those wanting to indulge the spirit as well as the soul, there is the Blue Bottle Bar Cafe. The eclectic menu reflects the theme: vintage blue apothecary bottles serving up magical concoctions flavored with local ingredients like the Jasmine Bud (VND120,000), sake infused with lychee and lotus flower buds served with lychee juice. Next door, the four show kitchens in the Four Plates restaurant serve up innovative Vietnamese, Japanese, Italian and grilled dishes like edamame salsa with olives, lemon and parsley (VND60,000) and prawn salad with roasted pumpkin and goat’s cheese (VND160,000). The beautifully laid-out breakfast buffet (also included) features gorgeous fresh juices, freshly made yogurt (perfect with the to-die-for homemade compote of passion fruit, dragonfruit, pineapple and watermelon), irresistibly cute Hoi An mini banh mi sandwiches and a full hot breakfast station to fuel you up for a day of exploring Hoi An’s Old Quarter, or simply lounging by the pool. 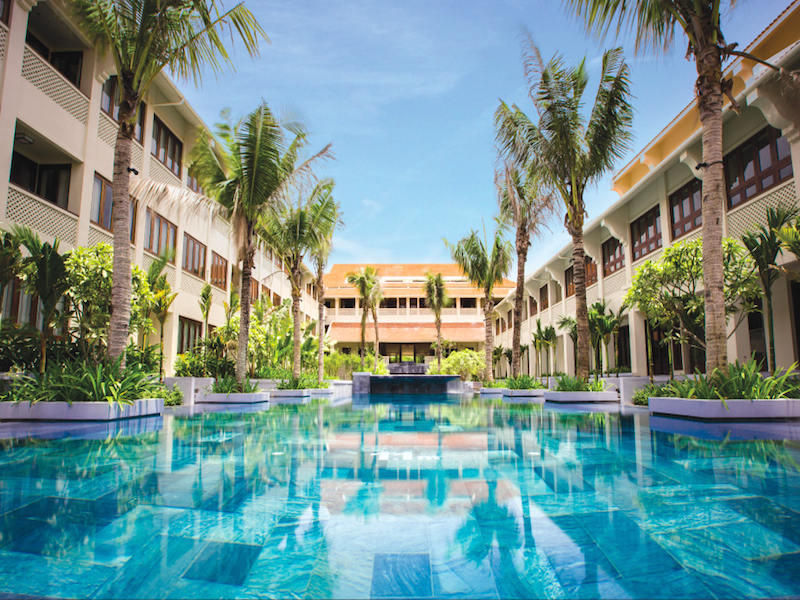 Just a short bicycle ride away from the Old Town of Hoi An, or a 10-minute taxi ride to Cua Dai Beach, Alma Courtyard is truly a sanctuary of discovery. Doubles start at USD101++, valid from Dec 20, 2014 to March 31, 2015 including breakfast, daily 90-minute spa journey and use of bicycles. For more, visit www. almacourtyardhoian.com or phone (+84) 510 3666 888.